If you don't know this already, I love Scrabble...a lot! I find an excuse to add scrabble into my life any way I can. Recently I made a cute sign for house. Scroll all the way to the bottom for pictures and tutorial. But before I get into that, here are a few of my scrabble things I have made, or purchased! 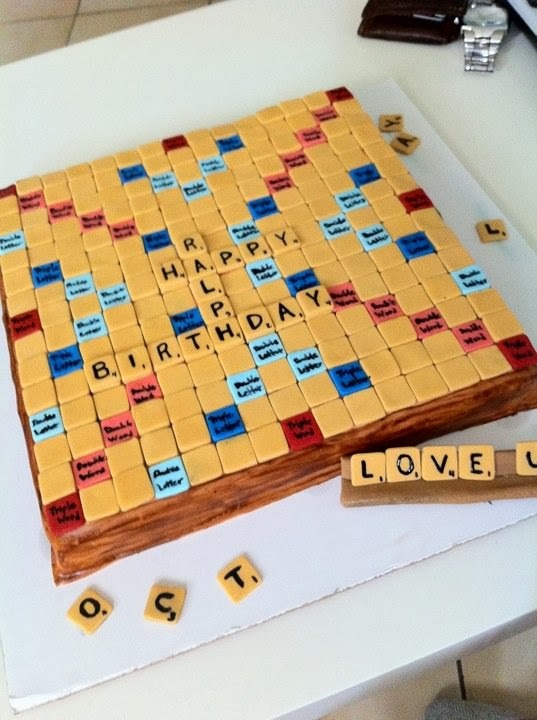 This is a cake I made for my husband years back, it was a hit since we both love scrabble! 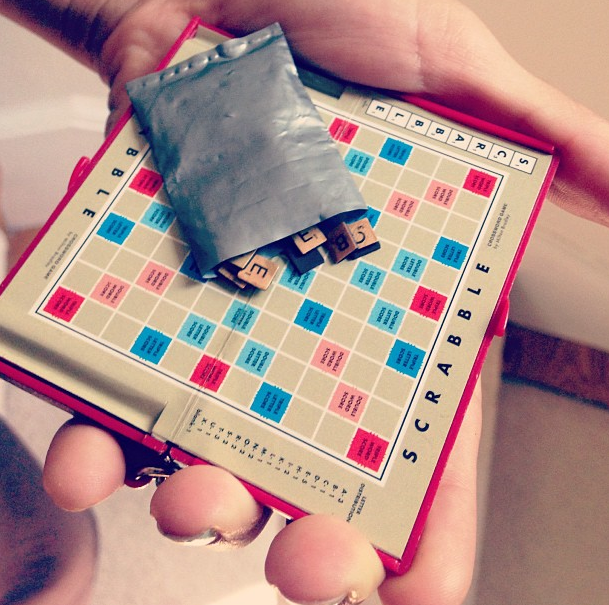 This is a travel size mini scrabble I used to carry around when I was younger! I was big nerd, and how can you not love this tiny little board game!!! Scrabble mugs! Yes, you heard right! I ordered these online and was in love with them!! Oh, and the very bottom of mug has the triple letter score square! Gah! See, I'm obsessed! But recently, I made a little cute sign for our house! It was of course pinterest inspired, but I think the ones I saw online were from etsy. Not too sure though. I first got actual scrabble letters, and decided what I wanted my larger scrabble squares to spell out. I went with: home. Then, to paint them on. I got black acrylic paint from the craft store and used a thing brush. I decided to do it free hand so I figured the thinner the brush, the more accurate I could be. Not exactly perfect, but good enough. I did a few more touch ups after this. Also, don't forget to add the number points on the bottom right corner. That will bring the whole scrabble feel together. Once it dried, I hung them on the wall. 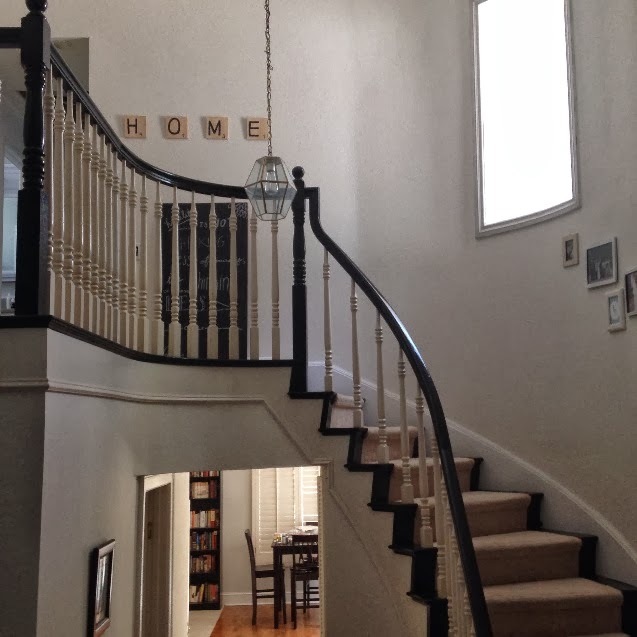 It makes the upstairs more complete. I love it so much! Very easy project, and you can make it say whatever you want! It's a very inexpensive project too, and a very unique piece!